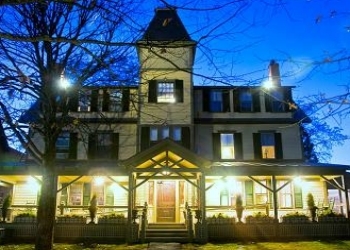 The Norwich Inn is a historic, full-service Vermont country inn located in Norwich, just across the river from Hanover, New Hampshire. An Inn has been on the Main Street site since 1797; the current Victorian Structure since 1890. This Dartmouth hotel is proud to offer 38 guest rooms, a Pub & Dining Room known as Jasper Murdock�s Alehouse and a Microbrewery featuring hand-crafted English Ales, sold only on site. We are proud to offer one of the largest wine selections in Vermont, housed in our new Wine Cellar, which is also available for private parties. 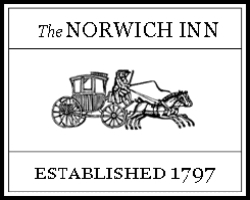 Local legend has it that the Inn and the Town were the inspiration behind the popular TV Show, �Newhart,� which was set in Norwich. Just 1.5 miles from the center of the Dartmouth College Campus, our hotel is a popular haven for alumni, parents and other visitors to the college. Close proximity to I-91 allows for easy access to Norwich-based King Arthur Flour (1 mi), Dartmouth-Hitchcock Medical Center (3.5 mi), White River Junction (5 mi), Quechee with the Simon Pearce Glass Factory (13 mi) and Woodstock (19 mi). For skiers, the Inn is located less than 1 hour from Killington and Okemo in Vermont and Mount Sunapee, New Hampshire. The Dartmouth Skyway is located just 10 miles away in Lyme, New Hampshire. Brew Master Patrick Dakin is proud to welcome you to the Brewery at the Norwich Inn, home of Jasper Murdock Ales. Our Ales have won 4 silver and a gold medal in the last 3 years at the Great International Beer Competition. 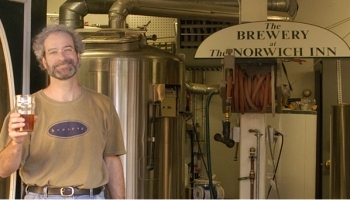 In 1993, this Vermont brewery tradition was revived at the Norwich Inn when Jasper Murdock's Alehouse began producing traditional English-style ales in 5-gallon glass jugs. By 1995, an historic livery building was renovated and outfitted with a new four-barrel brew house, enabling 125-gallon batches. Though the vessels are now larger, we remain perhaps the smallest brewery in America. Jasper Murdock's Ales are sold only at the Norwich Inn and you can take some home. Bottled brew is available by the 22 ounce bottle, by the case, or by the 5 gallon keg. Jasper Murdock's Ales are crafted from fine English malts, with hops grown in England and in our own hop garden at the Inn. Because filtration can strip flavor and body from a beer, the ale yeast is allowed to settle out naturally in an extended cold-aging period to ensure that all the goodness reaches your palate. The beer is then pumped underground from the beer cellars to our pub at the Inn. Inspired by an Irish classic. Garnet-red in color with a rounded malty flavor and a lingering hop aftertaste. A strong amber ale, full bodied, with a hearty hop flavor and a pronounced hop finish. A dark ale style dating back to the 1700's. Roasted malt lends chocolate and coffee-like flavors and aromas. This black ale has the characteristic flavor of dark roasted barley, the sweetness of caramel malt, a full body contributed by oatmeal, and an intense but balanced hop flavor.